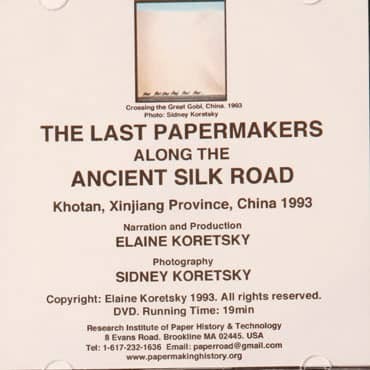 1n 1993, Elaine and Sidney Koretsky traveled from Xian to Urumqi China, crossing part of the Great Gobi Desert and the width of the Taklamakan Desert, following the same 'Silk Road" that Marco Polo traveled on in 1292. They traveled from one oasis city to another oasis city searching for evidence of traditional papermaking, but found none until they reached the oasis city of Khotan in the extreme western part of China. In Khotan, they found Uyghur papermakers and they documented the process in one of the workshops. The background music is traditional Uyghur music. Running time: 19 minutes. 1993.